Unprotected from harsh sea conditions and management, shipping containers can have a limited life with shipping companies and box leasing firms. Every year about a million leave the transport division – some are lost at sea (either with their ships or by being swept overboard, to become a danger to navigation) and others are written off in accidents. Some very badly damaged boxes are scrapped, but most pass into the hands of a new industry that has arisen to modify them for other uses, or sell or lease them. What are they used for? Just about everything. Containers serve as sleep-outs, garden sheds, workshops, artists’ studios, outdoor storage facilities, sales offices, ticket offices, cafes, site offices, portable toilets, and shower blocks. Aside from the rise in the domestic uses for shipping containers; governments and councils have also recognised that these boxes are affordable for use in the case of emergencies and disaster relief. And thanks to the forward thinking of today’s generations, we are creating new and inventive ways to use shipping containers in these situations as more than just homes, like the students from Princeton University. 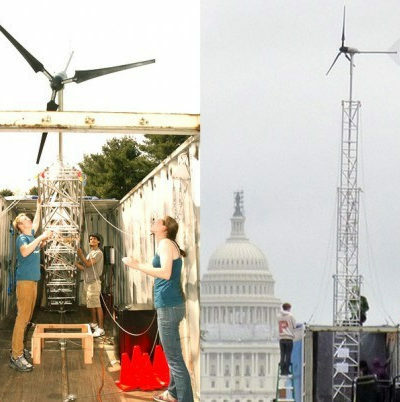 A design team of students from Princeton University created a solar and wind system that contains a 40-foot-tall “10 kW wind turbine, solar panels, batteries for energy storage, and the circuitry and mechanical systems necessary to erect and harvest energy from the hybrid system all packed into a standard shipping container for efficient deployment.” They intended to create a system capable of improving conditions in relief camps in disaster zones, eliminating the need for pollutant-emitting, hazardous diesel-powered generators. The team transported their shipping container system on a flatbed truck to the competition, where variable weather showcased the design’s range. “On the first day of the competition, the weather was sunny and still, so the solar panels were the prime source of power. The next day the weather turned windy and rainy, forcing the other competitors inside and raising doubts among some observers that the Princeton team members could raise their tower,” but as they did so with ease and smoothly generated power on both days, the students “really impressed the judges” explained project adviser, Catherine Peters. Needless to say, the students won and with a $90,000 grant from the Environmental Protection Agency, the students will now work to further develop the prototype to create a more powerful version. 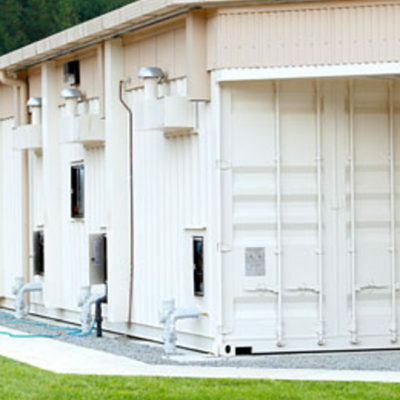 Closer to home, in 2009 the New Zealand government began converting containers into prison cells: Unit 11, the first 60-bed container unit, opened a year later at Rimutaka Prison. After the 22 February 2011 Canterbury earthquake, the authorities placed walls of containers behind houses to protect them from rock falls; elsewhere, they were scattered through city streets, protecting roads from dangerously damaged buildings and providing safe spaces for recovery workers. A shipping container was used to seal off the Pike River coal mine following the fatal explosions in November 2010. In Whanganui, a local company erected walls of containers around the Masters Games venue to reduce sound levels for local residents.